"Do I look old to you?" Local New York-based filmmaker Noah Baumbach has two new films coming out this year, the first being the wacky While We're Young about a couple growing older (see the trailer), and the other being Mistress America, a sort-of-sequel to his 2012 film Frances Ha. In honor of the upcoming release of While We're Young this spring, a nationwide screening series has launched called "Growing Up Baumbach" recapping at least four of his indie gems from the past decade. This includes The Squid and the Whale (still my favorite Baumbach film so far) and Kicking and Screaming, plus a few other films. Read on. The Growing Up Baumbach series will take place in Atlanta, Austin, Boston, Chicago, Denver, Los Angeles, Minneapolis, Nashville, New York, Philadelphia, Phoenix, San Diego, San Francisco, Seattle, Washington D.C. and West Palm Beach. Some places already have tickets for sale with event details/listings available from the official site. As far as I can tell, each local setup seems to be linked with a local art house or event, whether it be a film festival or screening series at your local cinema. Some will be showing just The Squid and the Whale, or just Kicking and Screaming, leading up to While We're Young. As for Mistress America, that film still doesn't have a release date set yet. Some places are offering free tickets to While We're Young if you see another Baumbach film. Just click above and check for details in your area. 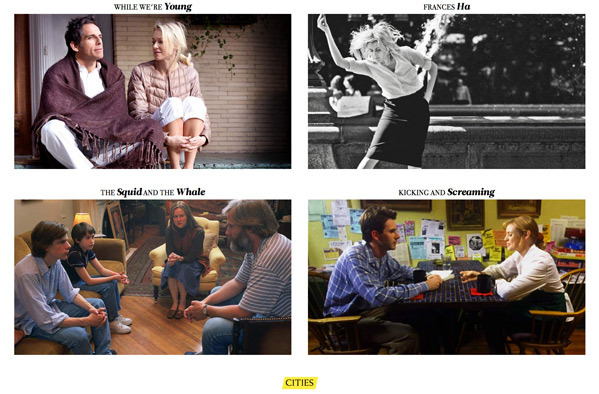 While We're Young is Noah Baumbach's eighth feature film, following Frances Ha recently and Greenberg before that. Ben Stiller & Naomi Watts star as a couple getting older, who befriend a younger couple played by Adam Driver & Amanda Seyfried. Typical Baumbach antics ensue, including an ayahuasca ceremony. Mistress America is Baumbach's next film after this one, while plays more as a spiritual sequel to Frances Ha, once again starring Baumbach's muse Greta Gerwig along with Lola Kirke. Both films might be worth seeing, whether you're a Baumbach fan or not. While We're Young arrives in US theaters on March 27th. FRANCES HA was fantastic. Baumbach's style is unique to him and I respect the hell out of him for sticking with his guns. Very few directors out there are able to wrangle the system in a way that allows them to create their vision.